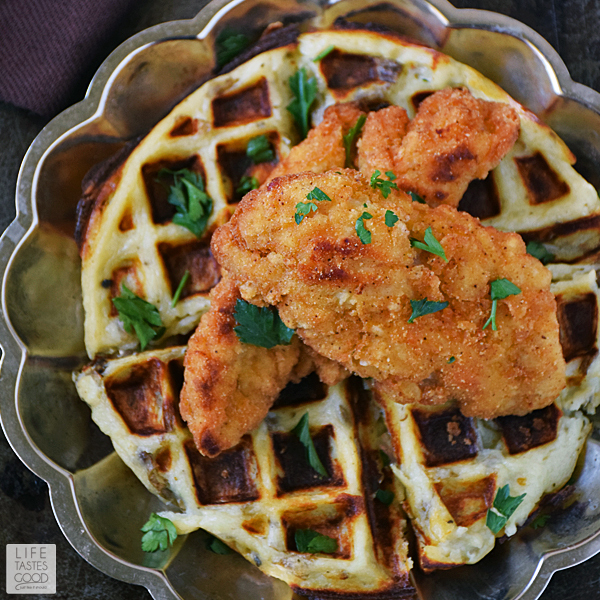 I had never enjoyed Chicken and Waffles or Poutine before this past summer, but now I'm hooked on both and couldn't resist fusing the two classic recipes into one incredible dish! 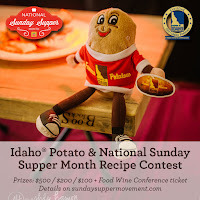 The #SundaySupper Tastemakers were challenged by the Idaho Potato Commission to develop unique poutine recipes using Idaho® potatoes in a variety of ways for National Sunday Supper Day! That's right! Today is the first ever National Sunday Supper Day, and I'm very honored to be a part of it! Scroll down past my Chicken and Waffles Poutine recipe for links to all of today's deliciousness. If you're like me, you'll want to try them all! Poutine is a Canadian dish traditionally made with French fries and cheese curds topped with brown gravy. It is delicious, and I've seen it made many different ways. Poutine seems to be the perfect dish to 'recreate' into something completely different, but still keeping the 'bones' of the dish. Although, I didn't use cheese curds in my recipe today, you certainly could top it with cheese curds and be blissfully happy! Traditional Chicken and Waffles is a southern soul food delicacy made with fried chicken and waffles served with butter and syrup just like you would eat for breakfast. I first heard about chicken and waffles on a cooking show and was shocked by this flavor combo! 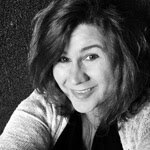 Don and I wouldn't have anything to do with it for several years, but my curiosity got the best of me at the Food Wine Conference last summer where Idaho® potatoes served a chicken and waffles poutine. I decided to finally see what the fuss was all about and bravely give it a try. 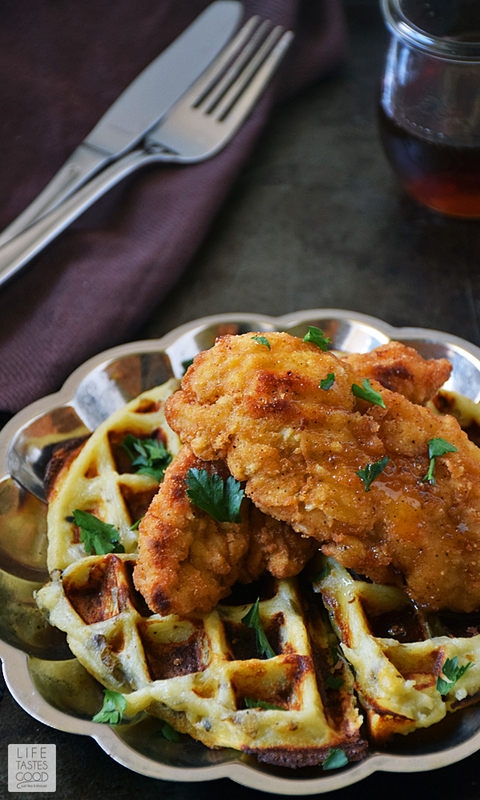 This was not your ordinary chicken and waffles. This was a poutine version, so the waffle was made out of Idaho® potatoes, but it was still served with fried chicken and syrup like the traditional soul food dish. OH MY YUMMINESS!! The savory chicken and cheesy potato waffles combined with the sweetness of pure maple syrup is a match made in taste bud heaven, y'all!! I texted Don immediately to tell him how much I LOVE chicken and waffles! He couldn't believe it, but I went on and on about it and promised to make it for him at home. It took several months for me to get around to it, but now that he's had them, he loves them too!! So, I guess the moral of the story is... Don't knock it 'til you try it! You might be missing out on some serious deliciousness!! Prepare chicken tenders according to package directions or make your own homemade. While the tenders are cooking, put cubed potatoes into a stock pot and add enough water to cover. Add the garlic and the salt to the water and bring to a boil over mid-high heat. Reduce the heat just enough to maintain boil, but not boil over. Boil until potatoes are fork tender, about 10 minutes. This time will vary depending on the size of your potato cubes. Drain the potatoes. Place the potatoes into a mixing bowl with 1/4 cup unsalted butter and mash the potatoes with the beater or paddle attachment of your mixer until smooth. Add salt and pepper to taste. Add 1/4 cup all-purpose flour, 1 egg, and 1/4 cup shredded cheddar cheese. Mix to combine. Heat waffle iron to medium heat. I use a Belgian waffle iron for best results. Spray the waffle iron with cooking spray and spoon in enough potato mixture to fill the spaces without spilling over. Close the lid and cook about 10 minutes. Time will vary depending on your waffle iron and the heat level. Keep checking it until the waffle is done to your desired crispness. Carefully remove the waffle to a plate and keep warm. Continue making waffles until the potato mixture is gone. 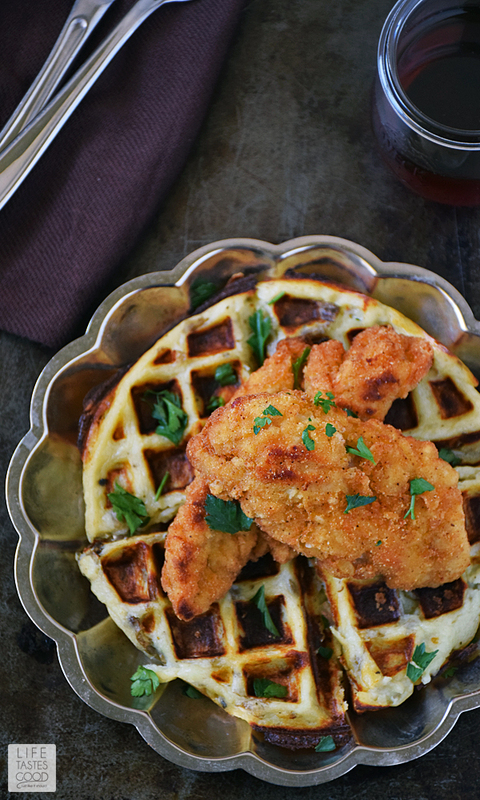 Top each waffle with chicken tenders and garnish with freshly chopped parsley. Serve with pure maple syrup and enjoy! For more delicious recipes, click here to check out the #SundaySupper Pinterest board featuring Idaho® potatoes. TIP: For best results, I always use Idaho® potatoes. 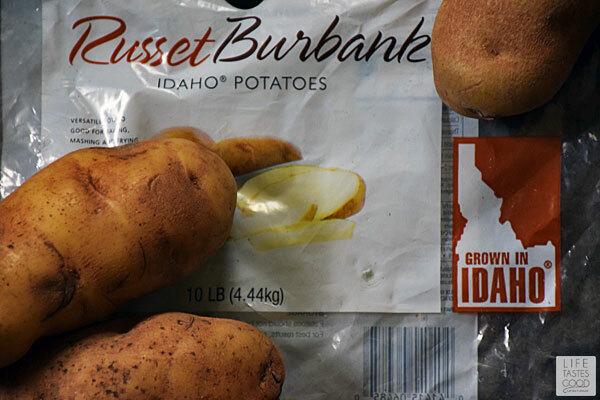 Idaho's unique growing season of warm days and cool nights, water straight from the mountains, and rich volcanic soil give Idaho® potatoes their exceptional texture and taste. You know you're getting the best of the best in potatoes when you see Idaho® potatoes. Oh, my word! I LOVE chicken and waffles. I can't wait to try this version of poutine. Just as delicious looking as I was anticipating, Marion! 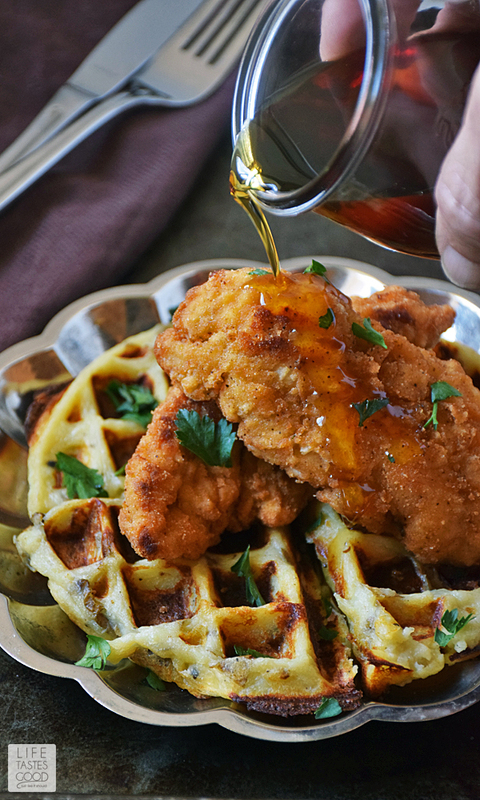 I've never eaten chicken and waffles, but now I'm dying for some!!! Your waffles alone sound incredible!! Thanks, Liz! We were pleasantly surprised with how well the flavors combine! This is a classic! I can't wait to try it in my new waffle maker! I love your innovative way to incorporate potatoes into your waffle batter. It's very creative and Happy #SundaySupper Day! Ooh this look so so delicious! !WANT RIGHT NOW! I could eat those waffles morning, noon, and night! I love your fresh take on waffles. That chicken looks so golden brown and delicious! Your poutine looks absolutely marvelous! You know I'm down with southern soul food. Thanks for the recipe! These were my first savory waffles and they were amazing. I followed the recipe exactly (apart from just using regular russets - all I had). There was a lot of steam coming from the waffle maker, but this is just an indication that they are not yet ready. After 9 minutes they were crispy on the outside and meltingly soft on the inside. With a hint of cheese and a hint of syrup (I used both maple and golden syrup and both were good) they are the perfect comfort food. I'll definitely be making these again. I love your Northern and Southern fusion of Poutine. These crispy potato waffles sound divine. I made this today and I must say that this is one delicious dish. The sweetness of the maple syrup is perfect on the freshly made chicken tenders. No need for any bbq sauce since the maple syrup perfectly flavors the chicken.the waffle iron gives the potatoes an excellent crispy outside.Highly recommend making this.